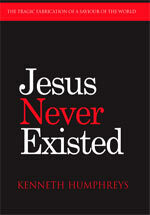 Jesus Never Existed – Christianity Without Jesus? JC can be anything you want him to be, hippy humanitarian or Lord of Hosts. Great, eh? Between 1947-1956 more than 800 ancient documents – nearly all in fragments – were retrieved from caves near the ruins of Khirbet Qumran on the northwest shore of the Dead Sea. Early copies of Jewish scripture (notably Isaiah) proved to be an obvious delight to the state of Israel, particularly as the discoveries coincided with the country's foundation. But the really interesting finds were the "sectarian" scrolls which reveal the machinations of rival groups during the birth pangs of Christianity. The orthodox Old Testament texts from Qumran were published readily enough. But the "sectarian" material was successfully hidden from scrutiny for nearly half a century by a cabal of Dominican scholars of the Ecole Biblique and an approved "international team" of Catholic and Jewish academics. God knows what material was spirited away to the bowels of the Vatican or simply destroyed. The Persian 'King of Kings' Cyrus the Great (580-529 BC) was an early saviour of the Jews. Antiochus Epiphanes – modernising policies favoured urban elite. Mattathias – began Maccabean war (and the long road to "Jesus") by murdering an apostate fellow Jew. "Let everybody who is zealous for the law and stands by the covenant follow me"
= The rules of initiation, liturgy, religious duties, and penal code for a counter-priesthood. The oldest of the scrolls, perhaps parts as early as 2nd century BC. But some additions as late as 1st century AD. • Messianic Rule (The Rule of the Congregation - 1Q28a) (mid-1st century BC). = The rules for the "last of days" for the "sons of Zadok". The "Messiah of Israel" is a political leader, subordinate to the High Priest. Together they lead a Council, effectively "pillars of the Community". II Maccabees – ideas about resurrection, judgment by God, and eternal life for those judged worthy. The 8-pointed star within a diadem is a Hellenistic symbol of kingship. Alexander Jannaeus – brutal Maccabean king crucified his enemies, including quite probably the Essene leader and early role model for JC. They are cursed by God and man, those crucified; thus you shall not defile the land which I give you." • Commentary on the Book of Habakkuk. Describes the struggle between the Teacher of Righteousness and his two opponents, the Spouter of Lies and the Wicked Priest.
" The city is Jerusalem, in which the wicked priest did works of abomination and defiled the Temple of God." Was Jesus, like Alexander the Great or Julius Caesar, a real historical figure to whom legends and myths became attached? Or, rather, like Huckleberry Finn or Sherlock Holmes a purely fictional character, passed off as a genuine personage or later historicized by other hands? With Jesus, most people feel more comfortable with the 'historical kernel' approach. It is intuitively satisfying to think that someone was behind the towering legend. We do, after all, have Christianity, and it is hard to give credence to the idea that someone "just made-up" Jesus Christ and then managed to convince anyone else to believe that he had lived and died. In fact, one can reach the conclusion that "there must have been a Jesus" without any research at all, which of course is what most people do. And yet, this "common sense" approach, though convenient, is a trap, a misapprehension condoned and encouraged by the priestly cohorts. They are happy to debate and discuss their hero's claims to deity ('a matter of faith') but want us all to accept Jesus of Nazareth as an historical fact. For them, the negation of that "fact" has cataclysmic implications and therefore they resist that possibility with every means within their grasp. And yet Gods do fall, as the ruins of Upper Egypt and Greece eloquently testify. Was there ever a Horus or an Apollo? It scarcely matters if some shadowy figure was ever consciously in the mind of the original priests who concocted the fables. The Olympian gods ruled for two thousand years and the Egyptian deities for twice that time. No one "just made-up" Jesus. If we step around the centuries of fabrication and glorification which informs everyone's perception of Jesus Christ and closely examine the two hundred year gestation period of the current Lord and Saviour we can see a perfectly plausible and, indeed, convincing process by which, upon the legacy of earlier times and from piety and scripture alone, the Christian godman emerged into the light. Beliefs created the man; the man did not create the beliefs. The notion of a periodic "saviour" goes back a long way with the Jews – at least to the religious centralisations of Hezekiah and Josiah in the 7th century BC – but then, as a marginal people the Jews were forever in the thrall of great empires. The birth of Judaism – following the collapse of the northern kingdom of Israel – enshrined the myths of Moses, Joshua, David and Solomon as sacred race heroes. But the theocrats had hardly begun their fantasizing when they were overtaken by events. During the 6th century BC the priestly elite found itself exiled in Babylon. A generation later, with the Persian overthrow of the Babylonians, the die was cast again. Now the "saviour" of the Jews was a Persian king, Cyrus the Great, whose imperial designs were served by a theocratic colony in Judah. Ever-adaptable, the grateful priestly scribblers bestowed surprising epithets on the fire-worshipping king of Persia. According to the later book of Isaiah Cyrus was both the Lord's shepherd and the anointed one (and the mantle of "anointing" signalled a divine dispensation to rule). "Thus saith the LORD ... Cyrus, He is my shepherd, and shall perform all my pleasure: even saying to Jerusalem, Thou shalt be built; and to the temple, Thy foundation shall be laid. Thus saith the LORD to his anointed, to Cyrus, whose right hand I have holden, to subdue nations before him; and I will loose the loins of kings, to open before him the two leaved gates; and the gates shall not be shut." Equally revealing are references to a certain High Priest who accompanies the gang of temple restorers (Zerubabel, Haggai, Ezra) and shows up in the books of Zechariah and Haggai – Jesus (Joshua bar Josedech). "The revelation made among your people in Babylon in the days of Jesus the priest, was an announcement of the things to be accomplished by our Priest, who is God, and Christ the Son of God the Father of all." The "poetry" of names and story elements will repeat ad nauseam as the legend of the universal saviour took shape. The Greeks displaced the Persians and in the course of more than 150 years of Greek rule the theocratic stranglehold which the Judaic priesthood had held on the Jewish people was broken. Hellenized reformers were in the ascendancy and early in the 2nd century BC the reformers, in collaboration with Seleucid king Antiochus Epiphanes ('the Illustrious'), attempted a thorough-going Hellenization of Judaea. Maverick priests Jason and Menelaus were raised to the High Priesthood, ending the lucrative, centuries-old monopoly of Onias and the Zadok family. Traditional worship, circumcision and the sabbath were all abolished. Religious reactionaries (the Hasidim), incensed by these developments, fermented unrest. Popular hostility to foreign rule was harnessed to priestly resistance of assimilation which rapidly became an armed struggle. At the head of the rebels stood the priest Mattathias (Matityahu) and his several sons. One of them, Judas, gained the epithet maccabi ('hammer') for his belligerency which gave the movement its name. Guerilla tactics frustrated the efforts of four successive Syrian armies to reestablish control. Although the Maccabean rebellion eventually won for the Jews a precarious independence from the Seleucid Greeks the new 'Hasmonean' dynasty itself faced formidable domestic opposition. The new monarchy was neither "Davidic" nor drawn from the high priestly line of Aaron and quite predictably, its priest-kings devoted themselves not to "righteousness" but to aggressive wars of plunder against Arab neighbours. I Maccabees acknowledges that although Judas Maccabeus "purified the Temple" of Syrian pollution – the basis for the Jewish festival of Hanukkah – his dynasty became intoxicated with power and thereby fell from grace. Around 142 BC, about the time that the Greek garrison finally withdrew from the citadel in Jerusalem, Simon Maccabeus assumed the positions of both High Priest and "ethnarch" – a priest/king of unlimited power. The Zadokites were not best pleased. Essenes – "Righteous Teacher, Son of Man"
Now displaced and threatened by the Hashmon family a disillusioned faction of the Zadokites fled for safety to the wilderness (a region adjoining the Dead Sea known as 'Damascus'). Retrenchment in the desert had its scriptural antecedents. Isaiah himself had directed "Prepare ye the way of the LORD, make straight in the desert a highway for our God." (40.3). In this pitiless environment the sharing of property and 'mutual love' were necessary elements of survival and became part of a code of religious honour. Initially at 'Damascus', then throughout Judaea, and later through successors in Jewish enclaves of the diaspora, these purists or 'fundamentalists' established hierarchically organized fraternities, fanatical, militant and almost exclusively male. Their revised Judaism reflected a simplistic division of the world into two hostile camps – themselves, the force for truth and righteousness; and their antagonists, the Sons of Darkness. Hopes of future glory came from the notion of the Kingdom of God – a happy state prophesied by the Book of Daniel written about this time. In a world-cleansing apocalypse the sinful evil-doers would be vanquished. "A Star has journeyed from Jacob, a Sceptre has arisen from Israel; and he shall crush the temples of Moab and overturn all the sons of Seth. And he shall rule from Jacob and shall cause the survivors of the city to perish. And the enemy shall become a conquered land and Israel shall display its valour. And by the hand of your Messiahs, the Seers of Things ordained, You have announced to us the times of the battles of Your hands, in which You will be glorified." " I shall see him, but not now: I shall behold him, but not nigh: there shall come a Star out of Jacob, and a Sceptre shall rise out of Israel, and shall smite the corners of Moab, and destroy all the children of Sheth." Convinced that they were themselves the 'Elect of God' who would therefore inherit God's kingdom, the Elders took it upon themselves to interpret allegorically the Jewish scriptures hitherto understood literally. Their anticipation and hope was that in a not too distant future a priestly messiah would arise, a sage who would correctly interpret the Law of Moses, heal the sick, and predict the future. His presence would signal the imminence of God's kingdom. Like latter-day cadres of Al Qaeda, the Zadokite/Essenes readied themselves for this coming conflict (of "Light and Darkness") with a diet of pious devotions and military training. From Daniel they took the phrase "one like a man" and rendered a new title for their soon-to-arrive hero "Son of Man", he who would usher in God's Kingdom and restore the rightful bloodlines. Pharisees – "Universal King, Raising the Dead"
About the same time that the Zadokites/ Essenes fled to the badlands another faction of the priesthood also broke from the Hasmoneans – taking the name Pharisees ('separate ones'), referred to in the coded language of the Dead Sea Scrolls as 'seekers of smooth things'. Austere, and devoted to strict religious observance, the Pharisees fiercely resented foreign influence in their land. Their sensibilities were especially offended by the impiety of the ruling house and caused these otherwise religious conservatives to augment existing scripture with contemporary reinterpretations known as "oral law." Abandoning the Hasmonean dynasty the Pharisees declared faith in and expectation of a future ideal and even universal king, one who would act as God's special agent, a true "Son of God." (The phrase will subsequently appear 81 times in the Gospels). "Then said he, These are the two anointed ones, that stand by the LORD of the whole earth." II Maccabees, written about this time, recorded the sentiments of the Pharisees. To the Pharisees belongs the dubious honour of inventing the concept of Holy War, a conviction that faith will lead the righteous into martyrdom and that it is their martyrdom which will prompt God to act. Again, Daniel served a purpose. The prophet's overnight stay in the lions' den (6.16) – as also the very similar "three men in the oven" story (3.19,30) – were now interpreted with a subtle scriptural inventiveness. It was not merely Israel which would be restored by the Almighty's beneficence; God had established a covenant with his "Elect". When they made the ultimate sacrifice He would deliver them of a personal resurrection. God vouchsafed a new eternal life to his martyrs. In traditional Hebrew belief seeing God was likely to be fatal (Genesis 6.13, Judges 6.22, etc.). But then it was necessary for the old tyrant to communicate with his favourites from time to time. In the early fables he took humanoid form, fighting as a warrior alongside the chosen. In later times (a tad less gullible?) God retreated more into the shadows, and, rather like UFOs and Aliens, chose to appear only to isolated individuals in remote places, particularly on mountain tops. In consequence, the "word of the prophets" (who had an exclusive line to the Almighty) assumed greater importance. Today, of course, He would probably use a web-cam. Alexander's Massacre – "Scapegoat Sacrifice"
Core support for the Maccabean royal house came from the aristocratic party of Sadducees. In principle, its members were firmly committed to the teachings of the written Torah. They rejected the innovations of "oral law" and the unsettling extremist notion of resurrection of the body after death. The clash of the reality of earthly power and the cohorts of frustrated piety reached a brutal climax during the reign of Alexander Jannaeus (103-76 BC), nicknamed the "Thracian" for his use of Greek mercenaries. Jerusalem-based Pharisees took advantage of a military reversal for Alexander to lead a rebellion. The sedition became a 6-year civil war. But the brethren had underestimated their ruthless opponent and even intervention by the Syrian king Demetrius on their behalf failed to save them. Rather, it ensured the vengeance of Alexander. Having driven out the Syrians, around the year 88 BC some 800 Pharisee and Essene captives held by Alexander were crucified within sight of the palace in Jerusalem (giving rise to the name of the killing field "Mount of Execution" or Gol Goatha). for as he was feasting with his concubines, in the sight of all the city, he ordered about eight hundred of them to be crucified; and while they were living, he ordered the throats of their children and wives to be cut before their eyes." – Josephus, Antiquities of the Jews, 13.14. Initially the Elect had been stunned and shocked by the execution of their Righteous Teacher. To the Essenes, Alexander was the "Lion of Wrath," his tyranny a time of trial. But on the other hand it was also a sure sign of the "Last of Days". Such is the nature of creative piety, from the setback the priests were able to fabricate a positive spiritual riposte: the notion of a propitiatory sacrifice. God had allowed the death of their leader as a sign of his redeeming love! and demonstrate Thy might through me ..."
– Allegro, The Dead Sea Scrolls, p90. Updating 'Isaiah' – "Suffering Servant"
Quite possibly, it was at this time that another, more famous, poetic work, Isaiah, gained those verses used to such great effect in a later age in the fabrication of "Jesus Christ." he hath put him to grief ... by his knowledge shall my righteous servant justify many; for he shall bear their iniquities ... he bare the sin of many, and made intercession for the transgressors." As the decades and centuries unfolded all the story elements which would eventually coalesce into the legend of Christ came into being. Each political and national crisis of the Jews engendered a restatement and a recasting of a perennial theme. The priestly authors of the Christ myth were not inventors – they were plagiarists.